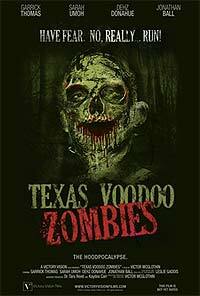 Texas Voodoo Zombies (2016) - Sci-fi-central.com. USA  2016  95m   Directed by: Victor McGlothin.  Starring: Sheleva Bailey, Jonathan Ball, Jasmine Bardere, Yarvette Bass, Zarlene Rogers Baxter, Marcella Benjamin, Gin Blanton, Tori Cage, KayDee Carr, Deanna Chandler, Zaki Omar Clement, Jasmine Collmer, El Jay da Comic.  Music by: Jason Robinson. He has to find a real job within 48 hours or go back to jail and serve out a five-year bid for habitual marijuana possession. Knowing that he has too many haters inside to last a single day if sent back to county lockup, Charlie Lewinsky - a shady probation officer, forces Doobie to become his personal weed dispenser. Desperate to break away from Charlie's control and his own checkered past, Doobie borrows a bug truck and strikes out to become the best exterminator in the hood. Always the irresponsible, skirt-chasing loser, Doobie wastes little time breaking all the rules and the trust of his clients when he mistakenly sprays several of his neighbors' homes with a deadly chemical mix. Just when it appears Doobie's his luck has changed, his ex-girlfriend - the scheming Voodoo priestess Sabrina, casts a spell that converts his toxic bug-killing concoction into a powerful Zombie potion. After turning his community into a walking dead hoodpocalypse, Doobie has a tough decision to make. He can stand and fight Zombies to the death with his big sister Kenya and friend Tracy or he run like hell! Making a B-grade film is hard to achieve successfully and having the audience on board with its lunacy. When it doesn't work, the film crashes and burns, but could turn into a entertaining train wreck. Then there are films like Texas Voodoo Zombies, where it starts like it could be laughably bad, but migrates into a misogynistic unfunny horror comedy. The film follows Doobie Jones, a man on parole trying to find employment to avoid jail time. He decides to bring friends over for a party when he "accidentally" drops a entire box of rat poison in some food for the guests. Soon, the guests turn into zombies and they must stop them from a "Zombie Hoodpocalypse". The sad thing is the only 2 funny things in the movie is a picture in a frame that randomly changes reactions and a ridiculous moment involving the Michael Jackson Thriller dance, however that doesn't make up for the fact these moments happen over a hour into a 97 minute movie. The films biggest fault is the director thinks everything Doobie says it's funny, but instead he comes off as a immature man child that makes him almost unbearable to watch at times. What makes it worse is almost every scene has Doobie in the film, so that weighs the films fun factor down HARD. Literally every female character is Also the dialogue is riddled with unnecessary exposition every time people talk to one another, and topped with wooden acting from every single character on screen. All of the female characters have no characterization other than sexualized almost portrayed as objects for Doobie and the other males. Texas Voodoo Zombies has one isolated funny moment but doesn't make up for the other 96 frustrating minutes. The dialogue is awful and the acting is even worse and has a very sexist mindset. To put it simply, this film is dead on arrival with no soul in sight. Review by travishouze from the Internet Movie Database.